The creatures of legend hold themselves above the petty powers of mere mortals. Yet by birthright, heritage or arcane training, some mortals inherit powers beyond the scope of the mundane. Sorcerers, Gypsies and gifted psychics - the key to puissance is dedication. For the master of the craft, there can be no mere dabbling, only the road to true power. 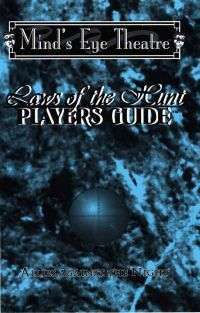 The The Hunter's Tools is the complete guide to the furthest reaches of mortal power for Mind's Eye Theatre. Including the heritage of Gypsies, the rare powers of dedicated psychics, and new sorcerous paths, this book has everything for the experienced hunter. Master-level sorcery, national influence and organizations that blur the boundaries between mortals and supernaturals raise the stakes of the game.